Space shuttle Endeavour is ready for the rollover from Orbiter Processing Facility 2 to the Vehicle Assembly Building at NASA's Kennedy Space Center, Fla. on April 10, 2009 to serve as the rescue ship for the last Hubble repair mission. NASA?srescue ship for a risky May shuttle mission to the Hubble Space Telescope moveda step closer to its Florida launch pad on Friday. Shuttleworkers at NASA?s Kennedy Space Center moved the space shuttle Endeavour from itshangar to the cavernous Vehicle Assembly Building at the Cape Canaveral,Fla.-based spaceport, where they will attach the spacecraft to its 15-storyfuel tank and twin solid rocket boosters over the next week. 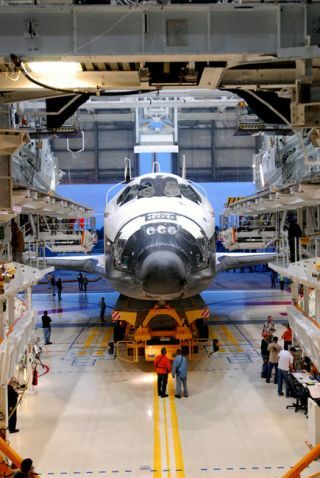 The work willaccomplish two goals at once for NASA to prepare Endeavour for a planned Junemission to the International Space Station, while priming the spacecraft to pulldouble duty as a standby rescue ship for NASA?s planned May 12 launch of the shuttleAtlantis toward Hubble. ?Theyactually finished up a little bit ahead of schedule and things are going quitewell,? NASA spokesperson George Diller told SPACE.com from thespaceport. Endeavour?ssister ship Atlantis is already atop itsown seaside launch pad for its May 12 blast off for the Hubble repairmission. NASA plans to move Endeavour out to a nearby launch pad on April 17,but hopes it never has to launch the shuttle on the rescue mission it is onreserve for. NASA hasbeen preparing Endeavour for an unprecedented rescue mission to retrieve theseven-astronaut crew of Atlantis in the event that shuttle suffers criticaldamage and is unable to return to Earth. As designed, the mission would launchEndeavour and a skeleton crew of four astronauts on relatively short notice torendezvous with Hubble, where Atlantis astronauts would perform a series of spacewalksto leave their stricken ship. NASA hassaid the chances of needing the rescue mission is extremely remote, but Atlantis?smission to Hubble is considered more risky than other recent shuttle flightsto the International Space Station. The spaceagency opted to have a rescue shuttle on standby because - unlike spacestation-bound shuttle astronauts, which can return to the orbiting laboratory iftheir spacecraft is damaged - the crew of Atlantis will have no safe haven. TheHubble Space Telescope flies in a higher orbit and in a different inclination thanthe space station, so Atlantis would be unable to reach the safety of theorbiting lab if it suffered critical damage, NASA officials have said. There isalso an increased risk of damagefrom space debris, they have added. Atlantisastronauts are expected to perform five back-to-back spacewalks during their11-day mission to add new instruments to Hubble, replace gyroscopes andbatteries, attach a docking ring for possible use in the future and makerepairs to equipment that was never designed to be fixed in space. If all goesas planned, the mission is expected to extend Hubble?s lifetime through atleast 2014. OnceAtlantis returns to Earth, Endeavour will switch from its rescue mission to aplanned space station construction flight. That mission is slated to launch inmid-June to deliver a porch-like experiment platform for the space station?sJapanese Kibo module and swap out one member of the outpost?s astronaut crew.